Pelican Coast Daze 2019 - Surfing in a Hurricane! Time to get your summer Daze on! The Pelican Coast Parrot Head Club's annual charity fund raising event is promising to be another great and memorable time! This year, Pelican Coast Daze will be held at the CFMA (Cajun French Music Association) building at 3481 E Prien Lake Rd. We will once again have great MUSIC, FOOD, RAFFLES, PRIZE DRAWINGS AND FUN! Nearby are two hotels for anyone needing a place nearby to spend the night after partying, the Quality Inn and Suites and Woodspring Suites. Wear your Parrot Head clothes, bring your own ice chest of beverages and your party self out to spend a fun day with friends and most importantly, help raise money for worthy causes. Included in the registration fee besides three great musical performances, Daren Sarver will be serving up his world famous "Daren Doggs" during the day and we will have another great meal prepared by Richard Cole's Fatboyz Kitchen Table & Catering. Registration cost is $45 per person and will close May 16, 2019, so get your money in by that date to receive a goody bag and tee shirt. Remember, Daze is open to basically anyone who pays the registration fee, not just our members. So this is your chance to invite your friends and neighbors to see how much fun we have while raising money and hopefully get them to join the Club! Doors will open at 11am. Silent Auction begins, ending at 6:00pm. 12:00pm - 3:00pm - Barefoot" Reggie Starret starts off the music for us and will get the crowd cranked up. Singer/song writer/ musician, Reggie is a 2017 and 2018 TRMA Song of the Year Award winning artist. Reggie is flying solo, or with his band, nationally and internationally. Relentlessly touring. Reggie rounded out 2018 performing over 180 shows all over the US and the Caribbean, and 2019 looks to be even bigger. Reggie performs an incredibly wide variety of music, from classic rock , to today's hit country, to reggae, to National and Globally acclaimed original songs. Reggie has opened for a diverse group of nationally known artists. From, The Spin Doctor's , Alan Jackson, Travis Tritt , Vern Gosdin, The Bellamy Brothers, Chairmen of the Board, Chuck Berry, Indigo Girls, Buckwheat Zydeco, Black Crows, The Tams, Fog Hat, The Drifters, Carolina Soul Band, T. Graham Brown , to, Little Texas, Ty Herndon , David Allen Coe and Shenandoah . Coming from a , wide range musical influences, and a solid back-ground of performing to thousands all over the world., there is truly plenty to enjoy at all his shows. 3:30pm - 6:30pm - Brent Burns was born in Oklahoma, raised in Arizona and arrived in Gulf Shores, Alabama in 1972. This son of the desert has become the poet laureate of the beach. In 2006, Burns was named “Official Music Ambassador of the Alabama Gulf Coast Convention and Visitors Bureau.” In 2008, Burns won three awards in the first ever Trop Rock Music Awards. Burns won “Entertainer of the Year,” “CD of the Year (for “Ragtops and Flip Flops”)” and a special WAVE award for his charitable work. A twice wounded, Purple Heart winning combat veteran, Burns also has the distinction of being the first American entertainer to perform for troops overseas after the tragedy of September 11, 2001. Burns’ musical career has taken him to Italy, Australia, Mexico and coast to coast in the US. Burns’ philanthropic projects have continued throughout the years. A portion of his CD sales goes to charities including the American Cancer Society, Alabama Gulf Coast Zoo, and Habitat for Humanity. Burns’ Habitat tribute song, “Build Them A House,” is available for free download on his web site, www.brentburns.com . The Silent Auction will end at 6:00 and dinner will be served around 6:30. 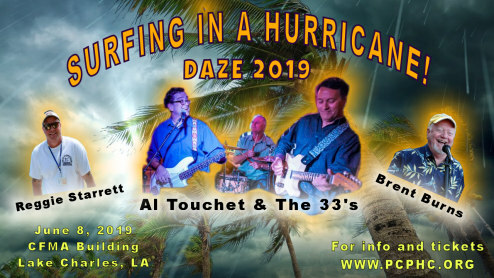 8:00pm - 11:00pm - Rounding out the evening will be Al Touchet, Joe Ecker, Dwight Landry and The 33's! This popular local rock band plays all the old time favorites, like Jimmy Buffett, The Eagles, Tom Petty, The Beatles, The Rolling Stones, Jackson Browne, John Mellancamp, Bruce Springstein, and more! They play a variety of great dance music, so I know we'll have a fantastic time! So as you can see, we have a super lineup of music, fun, and food along with raffles and a silent auction! Also, there are unconfirmed rumors floating around that the internationally renowned...oh, wait, make that ‘renounced’ Docta Phlocka , his rag-tag band of Restless Na’ives and the lovely and talented Phlockettes might show up! At present, their whereabouts are unknown, but rumors are that they're all in alcohol rehab or more likely jail, but that's another subject we won't talk about. All I can say is that if they show up, it'll be nice to have them perform sober for once. Hahaha, just kidding, lets just hope they can still stumble the distance to the stage and Docta Phlocka can bestow the much coveted "Island Names" on the deserving Parrot Heads who have yet to receive one. So release your inner "Oom-Bah-Yay" and come join us for the real reason why we do this, the raising of as much money for our charities as we can! Oh, and PLEASE consider donating an article or two for the Silent Auction, we would really appreciate it!